SURIGAO DEL NORTE - Several youth organizations in Surigao City converged recently for a blood letting activity dubbed “Give Blood, Give Life” at the Surigao State College of Technology (SSCT) quadrangle. The Rotaract Club of Metro Surigao(RACMS) - young Rotarians, headed its President Vanessa Dianne K. Pecho and SSCT’s Supreme Student Government (SSG) headed by President Jeroshie P. Rudela in cooperation with the Marajaw Inter-Fraternity and Sorority Association Surigao City Council (MIFSA) led by President Rafaelito Agra of Alpha Phi Omega (APO), Surigao Searchers Spareparts Specialist and Serviam General Merchandise owned by Martin Cafe, and the Philippine Red Cross – Surigao del Norte Chapter (PRC-SDNC) led by Dr. Romarico M. Trinidad and Mrs. Almejoy P. Sadangsa organized and facilitated the activity held last Friday, November 23, 2012 from 8:00am to 5:00pm. “When the RACMS conducted a meeting last November 17, 2012 at the President’s residence, we, the SSG, are informed and invited to be one of the partners for this activity so we immediately and positively responded,” Rudela added. “Technically, this life saving endeavour would benefit the donor, his or her system will be cleansed, their blood will be regenerated and it will make the donor feel good. Socially, they could help others who are in need or will be needing blood,” said Dr. Trinidad of PRC-SDN, who is also a Rotarian. 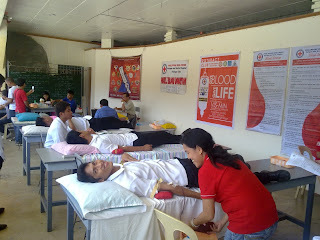 The 16th blood donor is the MIFSA Vice-President Mark C. Villanueva, RACMS President Pecho donated her blood as the 20th donor, and SSG Vice-President Harry A. Sabandal as the 36th donor. Philippine Red Cross – Surigao Del Norte Chapter staffers who actively facilitated the activity are Jumar Lipao an UPS member and PRC-SDN Licensed Instructor, Steve C. Beroy, Maria Jhona E. Tradio, Beverly Jane A. Goring, and Romelyn G. Minglana. “This life saving activity is in partnership with the Philippine Red Cross – Surigao del Norte Chapter, the Supreme Student Government of the Surigao State College of Technology, the Surigao Searchers Spareparts Specialist and Serviam General Merchandise, and the Marajaw Inter-Fraternity and Sorority Association Surigao City Council (MIFSA). We are thankful to them especially to SSCT College President Dr. Gloria C. Gemparo, Searchers and Serviam Owner Mr. Martin Cafe, PRC-SDN Chapter Doctor Romarico M. Trinidad and PRC-SDN Chapter Administrator Mrs. Marilou E. Taling for supporting us,” Pecho concluded.